Preheat oven to 350°F. Brush a 10″ tube pan with cake release (below) or grease and flour well. Beat cream cheese and sugar with a hand mixer until fluffy. Add egg and combine until smooth. Set aside. Combine flour, baking powder, cinnamon, salt and baking soda. Whisk together sugar, oil and eggs. Add the flour mixture a little at a time, stirring to combine. 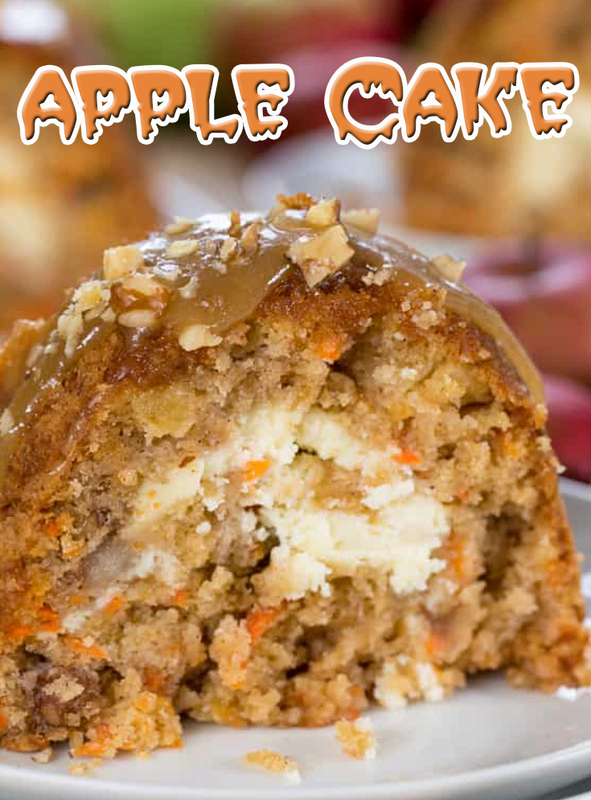 Mix in apples, carrots and walnuts. Pour half of the batter into the greased pan. Gently spoon the cream cheese mixture over the batter keeping it in the center. Top with remaining carrot apple batter. Bake 50-60 minutes or until a toothpick comes out clean. Cool 15 minutes in the pan, gently loosen the edges and invert onto a wire rack to cool completely. Bring brown sugar, butter and cream to a boil over medium high heat. Allow to boil 1 minute, stirring constantly. Whisk in powdered sugar and vanilla until smooth. Drizzle over cake while warm.